Twelve public minded men gathered at the offices of the Downingtown Review, a weekly newspaper, on Thursday, August 18, 1887 to discuss the urgent need for organized fire protection in the Borough of Downingtown. At that meeting, the dozen organizers decided to begin, what would be the ninth oldest fire company in Chester County, and agreed to name the new organization the Alert Fire Company No. 1 of Downingtown. Prior to the existence of the company, each property owner was responsible for his own protection. While various construction techniques afforded some protection from fire, most homes and businesses were likely to sustain significant damage from small fires. With no organized fire protection, a small fire could venture beyond a single property, consuming large sections of a town. The first members of the Alert Fire Company organized quickly and efficiently. Robert McGraw, who with eleven other citizens was organizing the Brandywine Savings and Loan Association, was elected the first President of the company. E. Vinton Phillips, operator of the Viaduct Roller Flour Mills, was elected Vice President. The other inaugural officers of the company were as follows: Ed M. McCaughy, Secretary; W. Howard Buckwalter, Assistant Secretary; James Leighton Guest, Treasurer; John Stout (three years), W. Howard Buckwalter (two years) and F. Fillmore Lewis (one year), Trustees. In addition to the above officers, the remaining charter members of the company that were also at the first meeting in August, were Ezra Brown, Walter H. Gracie (Editor of the Review), John H. Lillie and Frank McGorkle. In September, Mr. Stout was elected first Fire Marshal, or Fire Chief. Without funds or members, the twelve men began to build the company. Initial attempts to attract members were discouraging, with many citizens arguing that since their properties were insured, a fire company was not needed. Wearing red flannel shirts with the letter “A” sewn on the front, the men of the Alert Fire Company attempted their first fair during September of 1887. With the company turning out in parade every evening of the fair, the public slowly began to support the efforts of the group. The proceeds of the fair and funds gathered from the annual dues, $1 per member, enabled the fledgling company to purchase their first hook and ladder truck. The Rumsey and Company, of Seneca Falls, NY, hand drawn truck arrived on Monday, December 19, 1887 and the next night, the company responded to its first fire. The Alert Fire Company saved the molding room of the Downingtown Stove Works by carrying buckets of water from the Parke Run to the fire. No men from east of the Brandywine Creek had volunteered for the company until the fire occurred, but three members from the East Ward were soon elected. During this time of starting out, the small company was given permission to hold their meetings in the Excelsior Paint building on West Lancaster Ave., adjoining the public school. The hook and ladder truck was also kept in a small shed near the property. As the membership started to grow out of room in the Excelsior building, on April 01, 1889 the company moved their meeting place to the spacious GAR rooms in the Masonic Hall on the corner of Stuart and West Lancaster Avenues. On September 13, 1887 the officers and members petitioned the Court of Common Pleas of Chester County for a Charter and a Certificate of Corporation. Therefore, on October 13, 1887 President Judge J. Smith Futhey approved the request for the Charter and Corporation as the Alert Fire Company No. 1 of Downingtown. The following persons were named as the membership of the new corporation: President McGraw, Vice President Phillips, Secretary McCaughey, Treasurer Guest, Trustees Stout, Buckwalter and Lewis. Members: Ezra Brown, Samuel P. Brown, Mr. Gracie, Mr. Lillie, Mr. McGorkle, John Stitelery and J. B. Stringfellow. The members struggled for survival during the first few years. The company was forced to rely on fairs and annual dues for all of their operating funds, since petitions to the Borough Council resulted in no assistance. Savings and hard work enabled the company to purchase a lot on the east side of Downing Ave. on May 04, 1891 to construct a building to house the truck and conduct their meetings. On July 12, 1891 the contract was signed for erecting a two story gray stone and brick building on the lot. By December 01, 1891, a new firehouse at 17 Downing Ave. (now an apartment building) had been completed and interest in the company began to increase. The first meeting was held in the new building on December 07, 1891. Dangerous fires at the frame livery stable of the McFadden Brothers and at the Masonic Hall prompted Borough Council to begin support of the Alert Fire Company. Both fires found the new company without adequate equipment, requiring companies from West Chester and Coatesville to respond to help. When the Alerts requested assistance from the Washington (Hose) Fire Co. No. 1 of Coatesville, for the Masonic Hall fire on April 08, 1892, they loaded their steam fire engine onto a railroad flat car in Coatesville for the trip east. It was noted in newspaper accounts that 25 brave men from the “Washies” also boarded the train, arrived in Downingtown within six minutes and started pumping water onto the fire within five minutes of arrival! Despite those valiant efforts of the volunteers, the Masonic Hall was completely destroyed. Thomas Pedrick, a member of the company, canvassed the citizens of the Borough with a petition to Council for assistance in purchasing proper fire equipment, because the company was unable to afford new equipment after just building a new firehouse. The townspeople were concerned with what they witnessed at the Masonic Hall and with every property owner but two signing the petition; Council purchased a new state of the art, Silsby Steam Fire Engine for the company at a cost of $3,450. in the spring of 1892. 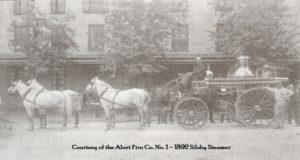 The Washington Fire Co. housed, or dedicated the Silsby steamer, while the West Chester Fire Company No. 1 (First West Chester Fire Co.) housed the Rumsey hook and ladder truck. The new station on Downing Avenue was also formally dedicated during the Alert Fire Company’s Grand Triple Celebration on July 16, 1892. Soon after the steamer arrived, membership began to grow and many prominent citizens of the Borough were supporting and joining the company. On September 21, 1892 the Alerts joined the Firemen’s Association of the State of Pennsylvania, of which we are still a member in good standing of the association. The company also began to send delegates to the state meetings and attended many of the other surrounding fire company fairs, with as many as 30 to 40 members marching in parade formation. In the mid 1890’s the town was expanding further away from the Brandywine Creek. Each year, as the company could afford it, they purchased more fire hose to be able to supply the Silsby. On December 24, 1894 the Borough opened the new water plant along with the installation of fire hydrants throughout the town. By the end of 1899, the final $275. of the mortgage was paid to Joseph Downing and the company was free from debt for the first time. Borough Council also began to conduct their meetings and business in the firehouse in the mid 1890’s, due to being easily accessible to the public. The stability provided by making the final mortgage payment enabled the members of the company to turn their attention to improving their services. Until 1903, a small bell was rung to sound the alarm for a fire. And, before the bell was obtained, the Pennsylvania Railroad donated a large steam locomotive wheel to the company. The wheel was struck with a large hammer to sound an alarm. As the population of the town was growing in the early 1900’s, it was difficult for the members to hear the signal for a fire if they were more then four blocks away from the firehouse. This also meant that when there was a fire, somebody had to go to the firehouse and strike the wheel or ring the bell. So, Council was petitioned by the Alerts to install a Gamewell Fire Alarm System in the borough. The Gamewell System was a series of red fire alarm boxes that would be mounted on telephone poles throughout the town. When there was a fire in the area, a person would go to the box and pull the handle. An electronic signal would be sent to the firehouse and the alarm would ring a bell to alert the members to respond. Council deemed that the new system would cost too much money at that time. However, they promised the company that they would start saving money, so that the system could be purchased in the future. While the system was not installed, a new, larger 1500-pound bell was finally purchased and installed in the bell tower to notify members of an alarm (This bell is on display and mounted in the front yard of the current firehouse.). The old, smaller bell was sold to the First Baptist Church of Downingtown. This old bell is also on display at the church on West Pennsylvania and Lloyd Avenues. Other improvements that the company made were in 1901, when the Constitution and By Laws were adopted for the Downingtown Fireman’s Relief Association. The Charter for the Association was granted by the Commonwealth of Pennsylvania, then in 1902. Two horses were purchased for $435. in 1905 to pull the Silsby and Rumsey. Up until this time, horses were borrowed from a member when there was a fire or the apparatus was pulled by hand. When the new horses were not at fires, they earned money for the company by pulling a wagon with a large home made wooden tank mounted on the back that was used in sprinkling the streets to keep the dust down. John B. Corcoran drove the team for two months, and then W. P. Downey was hired by the company as the regular driver at $50. per month. The local shop owners asked Borough Council to request that the fire company sprinkle the streets daily. As a result in 1905 the company purchased a Studebaker Sprinkler Tank Wagon that was designed for this purpose. When Mr. Downey was not sprinkling the streets with the tank wagon, he was contracted out using the regular wagon to make deliveries for the townspeople and businesses. This kept the team well exercised. 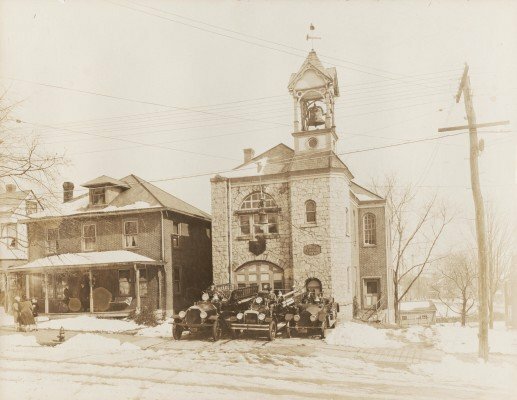 In March of 1906, the Downingtown Opera House on Brandywine Ave. was offered for sale to the Alert Fire Company and a committee was appointed to investigate the offer. By this time, the manufacturing area of Downingtown and the majority of the membership were located primarily in the East Ward, so the Opera house offered a more central location for a fire station. While the committee unanimously recommended against the purchase of the Opera House due to space restrictions for future needs, two reports were finally delivered to the membership on November 26, 1906. The majority report presented by Harry Worrall, recommended the purchase of the Thomas Downing lot, just east of the Log House for $2,000. on East Lancaster Ave. Charles Dapp offered a minority report, which recommended a lot on the south side of West Lancaster Ave., just west of the Public (what was to later be known as West Ward) School. After lengthy discussions and not being able to come to an agreement, the issue was postponed indefinitely. While discussions about the new quarters quieted for several months, a resolution was offered in December of 1907 directing the officers of the company to find “more commodious and more centrally located quarters east of the Brandywine Creek.” Several attempts to alter the motion were made before the resolution was accepted at the January 1908 meeting by a 100 to 69 vote. Samuel A. Black, Frank P. Miller, J. Penrose Moore, and William H. Broschard were appointed by President Samuel P. Bicking to recommend a solution to the membership. On March 30, 1908, the committee recommended that a new fire company should be formed east of the Brandywine Creek. It was also recommended that “since the Alert Fire Company No. 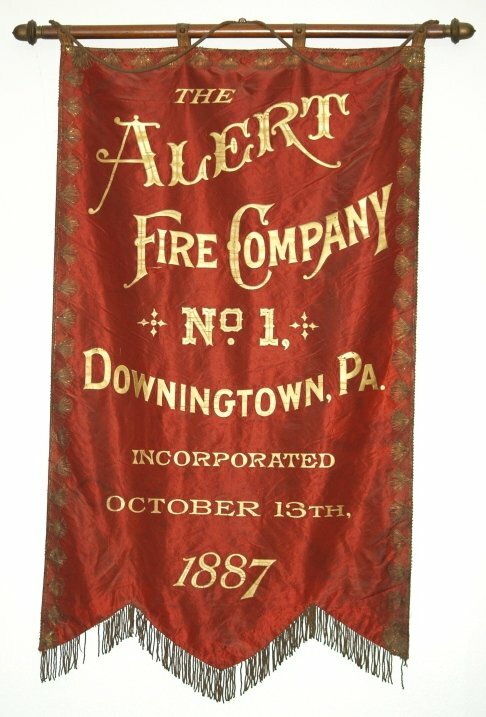 1 had been built, thanks to the efforts of all of the citizens of Downingtown, the assets of the Alert Fire Company No.1 should be split to form the new company.” The horses, the harness, the Silsby steam fire engine, the wagon and sprinkler and all of the money in the treasury ($646.07) would be transferred to the new company. And, the building and property would be retained by the Alerts. 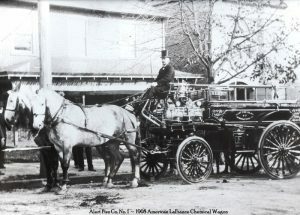 With a recommendation from the committee of the fire company, a resolution of Borough Council on March 24, 1908 had approved the transfer of the “heavy” (steam fire) engine to the new company and Council had agreed to the purchase of a new American LaFrance Chemical Wagon at a cost of $2,100. Moore, C. W. Reel, and W. H. Carey were appointed Trustees to hold the property of the new company until it could be formed. However, it was agreed upon, if there was a fire during this transition time that “all men of both Wards will work harmoniously together”. At the regular company meeting on April 27, 1908, President Bicking and 61 of his fellow members resigned to form the new Minquas Fire Company No. 2 that would be located in the East Ward of town. At that moment, the two groups discussed and agreed that they would always work side-by-side and together, extinguishing all fires. A ten minute recess in the meeting was observed while the 62 men exited the meeting. When the meeting resumed, the Alerts reorganized the company, electing the following new officers: Joseph H. Johnson, President (his second term); Allen E. Keim, Vice President; Josiah Philips, Secretary; F. J. McGraw, Financial Secretary; Louis L. Gibney and William A. Irwin, Trustees. The trustees were authorized to negotiate a loan for $1,000. to defray expenses. On May 25, 1908 the appointed committees reported, at the company meeting that they quickly replaced the team ($462.50), harness, a “Dump” wagon and sprinkler ($400.). Also, at this meeting, S. A. Black reported that he had Bell Telephone install the first ever telephone in the firehouse. A fair was held over the Independence Day holiday and the Alert Fire Company treasury was refreshed with over $1,500. in addition to great support from the citizens of the West Ward. Just prior to the fair, the “Ladies of the West Ward” organized a Ladies’ Auxiliary, with a membership of 185 to support and aid the men of the Alert Fire Company No. 1. The problem, which had forced the company to look for additional space, remained. During the fall of 1908, the trustees managed the construction of an addition to include stables in the basement, facing the rear and a meeting room on the second floor of the building. The second Grand Triple Celebration in the company’s brief history, this one celebrating the 21st Anniversary of the fire company, the housing of the new Chemical Wagon, and the dedication of the building annex was held on November 07, 1908, on the day that the Chemical Wagon was delivered. Also, at this time, the horses of the team were also named “Gib” and “Ped”. They were named after Mr. Gibney and Thomas Pedrick, two very active members of the company at that time. On December 23, 1909 the Borough recorded, what could have possibly been the first death of a citizen caused by a fire. As was reported in the December 24, 1909 edition of the Downingtown newspaper “The Archive”, one of the most disastrous fires in the history of Downingtown occurred at the large S. Austin Bicking paper mill. Ralph Entrekin was killed instantly at the height of the blaze when a 90 foot iron chimney fell with no warning in the rear of the mill. Entrekin, who was related to former Alert members who were at the time, members of the Minquas Fire Co. No. 2, along with two other employees of the mill were helping the two fire companies battle the blaze. The chimney fell so quickly that Entrekin did not have time to even react. The other two employees narrowly escaped the fall. It is determined that a fire was discovered by employees in the engine room of the mill and was probably caused by some overheated parts of the paper machinery. The fire practically destroyed the entire mill and neighboring buildings. The Washington Fire Co. of Coatesville assisted the Alert and Minquas with their steamer and hose wagon, along with 30 men. These brave men were able to stop the fire from spreading to the Downingtown Publishing Co., only a few yards away. The first recorded accident of the company occurred when the team accidentally hit milk cans, spilling the contents near Hoopes Garage in June of 1915. Hires Milk of Malvern sent the company a $9.57 bill for the damages. The Borough Solicitor advised President E. Vinton Phillips that the company or the men were not liable to pay for the damages. By 1917 the war in Europe had escalated and was a great concern to the locals, as many of their sons were going to Europe to fight. At the company meeting on April 24, 1917 the members discussed the war efforts at length. A resolution was made for the Secretary to write a letter on behalf of the members of the company to the President of the United States, Woodrow Wilson, pledging their loyalty to the President in support of his decisions and actions made during World War I and offered their services in any way to the President. While Borough Council continued to conduct the business of the town and Council meetings at the firehouse, the Trustees had given permission to Police Chief Thomas W. Gray to having quarters at the firehouse. This issue was discussed at great length by the membership and on November 27, 1917 Council agreed to pay the company $2. per month rent for the Police Chief’s quarters in the firehouse. By 1918, America had started to move away from the horse drawn fire equipment to motorized apparatus. Past Fire Chief, W. I. Pollock, Jr. was appointed to chair the “Team Committee” on April 30, 1918, to investigate the feasibility of motorizing the 1908 Chemical Wagon. The committee recommended on May 28, 1918, the purchase of a new motorized wagon rather than the refurbishment of the existing chemical wagon. This issue was tabled and then the members discussed whether their money would be better spent on a new modern pumper or a new motorized chemical wagon. After traveling to Parkesburg to see and operate their new Seagrave pumper, the company then decided to purchase the first motorized truck for the town, a new 500 GPM Combination pumper from the Seagrave Company for $10,000. on August 27, 1918. Member, J. B. Corcoran, a former Fire Marshal (Fire Chief) of the Borough, contributed the first $100. toward the new truck. The new Seagrave was delivered in May 1919. Many discussions were held in 1918 at the meetings, led by the Team Committee to discontinue using the sprinkler and selling the team. While the company continued to employ a driver for the team and the sprinkler, the Borough borrowed the sprinkler many times for the use of spraying liquid tar. A motion passed on June 25, 1918 to sell the sprinkler to the highest bidder, with giving the Borough the first chance purchase. It was sold to the Borough for $150. Because space was a premium in the small engine room on Downing Ave., on May 17, 1919 a public sale was held at the firehouse to sell the team, minor equipment and the Rumsey hook and ladder truck. They only sold some of the minor equipment while they were unable to sell the team or the Rumsey! On April 26, 1921, member Harry Paul organized and became the manager of the first Alert baseball team. The team played other area fire companies and young men’s athletic associations. Also on April 26th, a used 1915 Cadillac automobile was purchased for $300. from member, Hugh O’Donnell to motorize the old chemical wagon. The members of the company mounted the chemical tanks, the hose racks and ladders from the old wagon onto the Cadillac. The Cadillac was even repainted and lettered to match the Seagrave. It was then housed by the Minquas Fire Co. No. 2 on November 19, 1922. In 1926, however, Fire Marshal J. M. Binder began to express concern over the condition of the valves on the chemical wagon. By the end of May 1926, the members had decided to replace the Cadillac chemical wagon with their second motorized Seagrave, a 1926 Suburbanite, 400 GPM pumper costing $6,500. The Suburbanite featured inflatable tires, which the 1918 did not have! It was delivered on August 30, 1926. During this time of the mid 1920’s, the Alerts featured three motorized vehicles to respond to the Borough’s needs. The Cadillac chemical wagon was finally scrapped in 1928. On October 07, 1926 the third Grand Triple Celebration was held in Downingtown. The new Municipal Building, including a police lock-up with an office and Post Office were dedicated at 1:30 PM. Shortly after the dedication, officiated by Burgess (Mayor) Calvin G. Ax, the town held a parade, primarily consisting of visiting fire companies, from Hunt Ave. to the Alerts. The new Seagrave pumper was housed by the Fame Fire Co. No. 3 of West Chester, with President Herbert Ash, Sr. welcoming the crowd. After the Alert housing, the entire parade marched east on Lancaster Ave. to the Minquas Fire Co. No. 2 for the housing of their new 1926 Hale pumper. The Hale was housed by the Brandywine Fire Co. No. 2 of Coatesville. At 7:30 PM, an additional parade, consisting of area organizations, churches, drum corps and bands, was held, starting at Hunt Ave., traveling east on Lancaster Ave. to Uwchlan Ave. Then they countermarched to Stuart Ave. where the parade ended and the guests enjoyed refreshments at each firehouse. 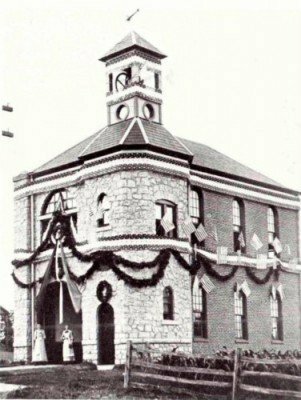 With the new Municipal Building in use, Borough Council ended its need, from the early 1890’s to 1926, to meet and conduct business at the firehouse. The fire station on Downing Avenue was never built to house motorized fire equipment. With the team finally sold and two motorized pumpers along with the old hook and ladder in the building, the company was very cramped in the old house. President Ash appointed a committee just after the sale of the team in 1929 to find a site in the West Ward for a new station. The Pedrick Blacksmith Shop on West Lancaster Ave. was purchased almost one year later for the site of a new fire station. The old Rumsey hook and ladder was also finally sold in the late 1930’s to a priest in the Villanova area who was going to restore it. The company chose not to begin work on the station until 1936, due to the Great Depression in the United States and they quickly realized that the lot they had purchased was not large enough for a station that would accommodate their needs. While the Building Committee attempted to gain additional property along West Lancaster Ave., the Trustees attempted to secure a price for the Ringwalt property on the 100 block of West Pennsylvania Ave. The price for the Ringwalt property was too expensive and the issue of a new station was temporarily tabled. By February 1940 however, the Trustees had obtained an option to purchase the West Pennsylvania Ave. site from the Ringwalt Estate. Also at the same time, the membership had been discussing and was concerned with purchasing a new modern, state of the art Quadruple “Quad” fire engine to replace the aging 1918 Seagrave. The company could not accommodate both purchases, so a committee was appointed to discuss the matter with Borough Council, to determine if the Borough would be able to purchase the truck. If Council approved the purchase, the company would be unable to properly house the Quad on Downing Ave. After considerable discussion, the membership approved the appointment of a building committee to begin work on a new station and instructed the apparatus committee to continue working with Borough Council to purchase a new truck. After much discussion for several months a special meeting of the company was held on September 05, 1940 to finally determine whether a new station should be constructed. Land adjacent to the Downing Ave. station could not be purchased because right-of-way agreements between the owners of the neighboring property and other parties had been executed. Accordingly, the membership voted 57-1-1 to authorize the committee to sign a contract for construction of the new station on the Ringwalt Estate. William Sauers was awarded the construction contract for $42,153 and ground was broken on West Pennsylvania Ave. on September 25th. The first meeting was held in the new building on May 26, 1941. The total construction of the building cost $45,000. The following comments about the newest fire station in Chester County were written in a June 20th front page article of the Daily Local News. The beautiful all gray stone two story building with a slate roof had an overall size of 125 ft. x 53 ft., a spacious engine room that was 58 ft. x 24 ft. and featured one of the first, new electric overhead doors and “newfangled” fluorescent lights in Chester County. On the second floor, there is a 70 ft. x 50 ft. auditorium with space for 360 seats for a banquet or 520 seats for a show. The stage is a spacious 24 ft. x 18 ft. with a heavy weight crimson curtain and a stately “AFC” embroidered in gold. The Ladies Auxiliary also purchased $2,100. worth of new equipment, dishes, utensils and glassware to be used for banquets and parties. It was time for the fourth Grand Triple Celebration with the formal dedication of the building on Friday, June 20, 1941 at 8:30 PM. President W.I. Pollock, Jr. was the master of ceremonies, with the Fame Fire Co. No. 3 of West Chester conducting the official dedication of the new building. The second part of the celebration was at 12:00 PM on Saturday, June 21st at the Municipal Building. All of the indebtedness on the building had been paid off to the Citizens Holding Company and Council burned the mortgage at the celebration. Council deemed the day, “82 Years of Progress” for all of the citizens of this fine town. The third event of the weekend, also on June 21st, was a parade which started at 2:30 PM and was followed by the housings for the new $12,000. 1941 Autocar Custom Quad of the Alert and the new $8,000. 1941 Autocar pumper of the Minquas. Both of these trucks were built at the Autocar Works in Ardmore, PA. The Quad featured a 750 GPM, two stage Hale pump, 100 gallon booster tank, 700 ft. of 2 1/2”, 300 ft. of 1 1/2” and 200 ft. of 1” hose, a portable deluge gun, as well as, ten ground ladders totaling 219 ft. The housing ceremonies for both new trucks were preformed by the members of the Coatesville Fire Department. Chief of the Downingtown Fire Department, William McD. Barrett was the honored host for the visiting fire companies for the day. At 9:00 PM, refreshments and dancing at each firehouse were enjoyed by the guests. The lot adjoining the station was purchased soon afterward from George Nixdorf for $1,500. and the Downing Ave. firehouse was sold to the Downingtown Masonic Home Association for $5,000. Even though the new Quad was purchased to replace the old 1918 Seagrave, the company decided to retain the old truck to be used for off road brush fires and with the war in Europe developing, there was a need to have extra fire trucks available to the community. And, they actually had extra space in the new engine room. Therefore, during the 1940’s the new fire station housed the 1918, 1926 Seagrave’s and the 1941 Quad. However, the 1918 eventually meet its demise when it was “retired” to Cohen’s Junk Yard in Thorndale, after it ran into a ditch, breaking the chain casting housing while fighting a fire at the Downingtown Industrial and Agricultural School on Horseshoe Pike, East Brandywine Township in 1946. In the summer of 1941, while cooking hotdogs at the company carnival, Dan Davidson attempted to crawl under a table at the hot dog stand and was scalded with boiling water after a large pot accidentally fell on him. Mr. Davidson was immediately taken to the hospital, where he later passed away as a result of this injury in the accident. This has been the only death of a company member while participating in a fire company activity. 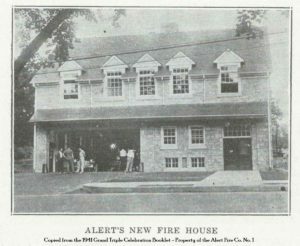 From the opening of the Pennsylvania Ave. station to the present, the members of Alert Fire Company have worked diligently to supply modern firefighting techniques and equipment to the citizens of Downingtown. With the assistance of the Honorable Congressman Paul B. Dague, from Downingtown, the Department became the first independent volunteer fire organization in the United States to be issued a two-way radio license by the Federal Communications Commission, as station KGA 366 (154.310 MHz). The system went on the air at 7:41 PM on September 26, 1949, but trouble soon began. An experienced FCC engineer was called to Downingtown to work out interference problems between the new system and the Sheehy Taxi Company. The interference problem was soon resolved and the fire radio system remains in service today with the base station residing at Alert. An eight-inch horn at the Municipal Building was added to the Gamewell Fire Alarm System in 1948 in hope that the alarms could be heard throughout the town. This horn was very effective for the firemen, due to its ability sound off the same pattern that was being “tapped-out” in the Gamewell System. This horn and the house sirens at each firehouse were used until the mid 1980’s, when high maintenance costs prevailed and the members were issued personal pagers that “alerted” them as to where the was a call. The Alerts also received a new 1947 Triple Combination 750 GPM Seagrave pumper in the early winter of 1948. The new Seagrave featured a V-12 gasoline engine, a three man enclosed cab, a split hose bed with a walkway in the middle leading to a bench-style “jump seat”, a 100 gallon booster tank and a 24 ft ground ladder. The new Seagrave was the first apparatus in Downingtown to have an enclosed cab. And, the “jump seat” was also a first for the department. After the new pumper arrived, the 1926 Seagrave was sold to Bill Rowland, a member of the Minquas, who then donated the truck to a fire company in Halifax, VA.
Also, in 1948 the first television set was installed in the social room of the firehouse. This was a very popular item, as most people at that time did not own a television. The mortgage on the station was also paid by the proceeds of several carnivals by the end of 1947. The membership entered the 1950”s with fairly new equipment and very few debts. The last surviving charter member of the Alert Fire Company, Frank E. McCorkle, died in July of 1951. In 1955 the company purchased a 1941 Chevrolet brush fire truck from the Radnor Fire Co. for $1000. to supplement the existing equipment. This allowed the crew to take a smaller truck off-road and into the wooded areas while also increasing the fleet to three first class apparatus. In addition to the equipment, the facilities also continued to be improved. The coal heater at the station was replaced with a modern natural gas heater in 1957. The members decided to make the switch to natural gas after the Delaware Valley suffered through a coal suppliers strike in the early 1950’s in addition to the rising costs of coal. The 1941 Quad was replaced with an American LaFrance, open cab, 85-foot mid-ship aerial ladder truck, at a cost of $43,000. in 1963. This was the first aerial ladder in the borough and featured spacious equipment compartments and over 200 feet of ground ladders. An enclosed cab was later installed in 1969, after the truck was involved in an accident when it collided with Fire Chief Earl Stern at E. Lancaster and Brandywine Avenues, while en-route to a fire call. In 1963, the Quad was then sold to the Primos-Secane Fire Company of Upper Darby, PA. Who then later sold the truck to the Wildwood (NJ) Fire Department. On Saturday, September 12, 1964 the new ladder truck was housed by the Minquas Fire Co. No. 2 after festive parade through the town. The housing ceremony was led by President William G. Barrett and Chief of the Department Alfred Peterman. Minquas Captain, Lewis Pyle, presented President Barrett a gift of an oxygen cylinder, on behalf of his company. A 1966 Chevrolet box/panel truck was purchased by the company, from the Boyertown Body Works in 1965 for $4,267. to be used as the first rescue truck of the department. Soon after the new rescue truck arrived, it was equipped with two port-a-power spreading tools, a chain come-a-long, a circular saw, chains and ropes. This truck was totally enclosed and had two bench seats for eight crew members to sit will en-route to a call. Later, in 1972 the new Hurst “Jaws of Life” 32” rescue tool spreaders were added to the rescue truck. The Alerts were the third rescue crew in Chester County to obtain the new hydraulic vehicle extrication rescue tool. Throughout the late 1960’s and into the 1970’s there were not many rescue companies in existence in Chester County. During this time the Alert rescue crew covered a territory as far east as East Whiteland Township and as far north as Ludwigs Corner! Many hours of rescue training were spent in those early years and crew became very efficient and talented in vehicle extrication’s. 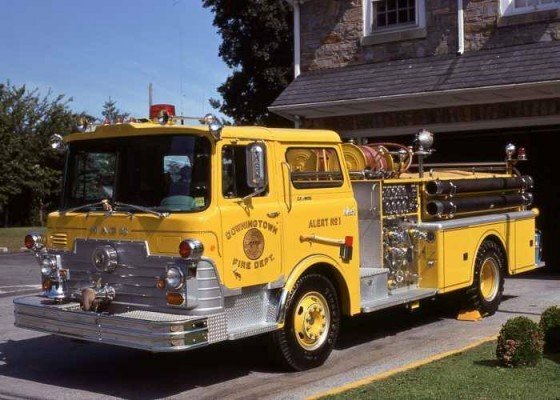 A 1969 Mack CF style pumper was ordered from Allentown Mack, to replace the 1947 Seagrave in 1968. This was the first yellow fire truck in Chester County and affectionately became known as “The Yellow Bird”. This truck featured a Maxidyne diesel engine, a 1250 GPM Waterous pump, a 300 gallon booster tank, twin ¾” hose booster reels, 1000 ft of 3” (later 5”) supply, 400 ft. of 2 ½” and 300 ft. of 1 ½” (later 1 ¾”) hose, foam pales, nozzles and appliances, 24 ft. extension and 16 ft. roof ladders and jump seat mounted SCBA. The Yellow Birds primary responsibility was a water supply pumper for the ladder truck. The 1947 Seagrave pumper and some equipment such as nozzles and fittings were sold to the East Brandywine Fire Co. The used 1941 Chevrolet brush truck was sold to car dealer, Bill Harrison of East Brandywine Township. Mr. Harrison then took the old truck to the Manheim Auto Auction in Lancaster County to be sold. The old truck was replaced with a 1971 Chevrolet four wheel drive pickup truck costing the company $3,725.32. This pickup truck was the second yellow fire truck for the company. It was taken to Chemical Leaman Tank Lines, on Wallace Ave. to have a stainless steel water tank custom fabricated and a pump installed in the bed of the truck. A custom made tailstep and hand rail was also installed in place of the back bumper. Also, in 1971 the company joined the Chester County Fire Board and became known as Station 45. County low band radios were installed in all of the trucks at that time. Prior to this time, all emergency dispatching was conducted via the radio base station at Alert, by our “House Man”, Philip T. Swank. The department continued to use our own high band radio system for fireground communications and Mr. Swank “Phil” continued to be employed by the company until his death in 1985 as a house man/janitor. In June of 1972, Hurricane Agnes flooded the borough and surrounding communities severely. The department was pressed into action and made many rescues of flood victims and assisted others with evacuations. A new Brunswick pool table was purchased in 1974 and is continued to be enjoyed by all. Our nation celebrated its 200th birthday on July 04, 1976. The Chester County Commissioners elected to have one large county parade in Downingtown on July 04th. The Downingtown Fire Dept. played a major role in helping to organize, coordinate and to provide any emergency assistance for the estimated 2,000 people that attended the festivities before, during and after the parade. In 1978, Karol Taylor Beiler became the first women to be an officer of the company when she became Financial Secretary. In June of 1983 a group of 18 members traveled to St. Clair, Schuylkill County, PA in the 1969 Mack pumper, the brush truck and several cars to help our sister company, the Alert Fire Co. No. 1, celebrate their 100th Anniversary. Our two trucks members were honored guests in the line of march directly behind the Alert St. Clair 1968 (red) Mack pumper during the parade. Eight of our members bunked overnight in the second floor meeting room of the one bay firehouse, after the anniversary celebration, block party and bean soup festival. The next morning, the Chief and Assistant Chief cooked us a gigantic buffet breakfast that was enjoyed by all. In 1969, the Members of the Alert Fire Co. first suggested an addition to the Pennsylvania Ave. station. A proposed 30 ft. by 60 ft. structure would have cost $37,000, but the membership chose not to build. The need to purchase new equipment, especially a new aerial truck, required the membership to reconsider their decision in 1983 due to new aerial trucks being manufactured larger then the current trucks. On January 30, 1982 President Robert P. Stevens appointed Bryan E. Rambo to chair a committee to build an addition to the existing building. Ground was broken on June 06, 1984 by Russell and Armstrong Construction Co. The new addition was completed on November 01, 1984 at a cost of $135,000. It consisted of a new radio communications room and a three bay engine room measuring 52 ft. wide by 72 ft. deep. Because of age, the existing ladder and rescue trucks were beginning to cost more for the Borough in repairs. The Executive Board along with the active force officers approached the Borough Council asking for additional moneys to repair, repower and update the existing two apparatus. After a feasibility study, the Borough Council decided to replace the two trucks. On June 25, 1987 the Alert membership and Borough Council welcomed the arrival of a new 100 ft. ladder tower constructed by Ladder Towers Incorporated of Ephrata, PA and a Heavy Rescue Truck built by Saulsbury of Tully, NY. Both Trucks arrived within ten minutes of each other. The ladder tower body and Spartan chassis were constructed from stainless steel at a cost of $415,000. It has a solid, self leveling platform at the end of the 100 ft. aerial ladder, a pre-piped waterway, 1500 GPM Hale pump, and full complement of ground ladders, forcible entry and salvage tools. The new rescue truck body and Spartan chassis were also constructed from stainless steel at a cost of $210,000. It features a 21 ft. walk-in, seven person body, complete with a custom built incident command center. Also, full length and depth compartments that is equipped with a complete Hurst “Jaws-of-Life” hydraulic rescue system, air bags for lifting, high angle rope rescue equipment and forcible entry tools. The 1963 American LaFrance aerial truck was sold to the Coudersport Fire Dept. of Potter County, PA. While the 1966 Boyertown Body rescue truck was sold to the Downingtown Fire Police for $1. and was housed in the detached one bay garage at the rear of the property of the company. This truck was used for several years, and then it was sold to GDS Construction Company of Downingtown. September 05 – 12, 1987 the men and women of the Alert Fire Co. celebrated their 100th Anniversary by having the fifth Grand Triple Celebration, with the largest parade ever in Chester County. The celebration started on the evening of September 05th at 7:00 PM, with the housing of the two new trucks and the dedication of the new Engine Room addition to Mr. Swank. Dancing and refreshments were enjoyed by the estimated 175 to 200 guests after the dedication in the engine room. President Stevens was the Master of Ceremonies for the gala evening. Borough Council President William J. Whiteman made the official presentation of the two new trucks to fire department Chief Richard J. Keers. The new rescue truck was then housed by members of the Uwchlan Ambulance, East Brandywine, West Bradford and Minquas Fire Companies. 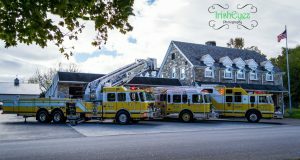 The housing of the new ladder tower was followed by the Lionville, West Whiteland, Thorndale and Minquas Fire Companies. Throughout the week there were several fire company functions including a week long Open House to the public, an “Old-Timers Night”, which honored all of the past living and deceased Active and Social members of the company. The week long celebration ended with a parade on Saturday, September 12th, offering $2,000 and over 50 trophies as awards to several fire truck, float and marching band categories. A few of the highlights from the three hour long parade were 23 marching bands including the Quaker City and Avalon Mummer Marching Bands from Philadelphia and the U.S. Marine Corp. Drill Team from Washington D.C. that were hired by the Alert Fire Co. to participate in the parade. There were over 200 fire trucks of all types, old and new in the parade. Our brothers from Alert in St. Clair, PA were also honored guest and paraded directly behind the Downingtown Fire Dept. Companies as far away as the Sterling (VA) Rescue Squad participated in the parade, as well as companies from throughout PA, DE, MD and NJ. After the 100th Anniversary and triple celebration, the members were able to renew their focus on its mission of protecting its citizens. The commitment to training, updating standard operating procedures, safety, and the continuous improvement of the level of service that the fire company provides were high priority. To facilitate that mission, trucks and equipment of the fire company needed again, to be up to date, well organized and knowledgeable to all of the fire company line officers and firefighters. Good organization, attention to detail, cleanliness and maintenance of the trucks and its components not only contributed to the improvements of the company’s fire fighting efforts, but it provided them with equipment that has excelled at all levels of the parades and vehicle rescue competitions that have been attended over the years. Over 100 trophies have been placed in the trophy case since the 100th Anniversary. A large percentage of the trophies won are first place awards in some of the most prestigious parades in the region and state. 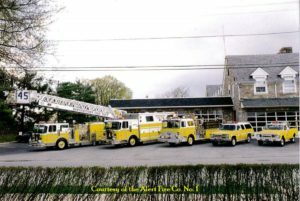 In 1993, the company traveled to Norristown, PA for the 114th Annual Pennsylvania State Fireman’s Convention Parade and won the following awards: First Place – Best Appearing and Equipped Tower Ladder; First Place – Best Appearing and Equipped Heavy Rescue and First Place – Best Appearing Saulsbury Built Apparatus. Ever since horses started to pull the steamers and wagons to fires, firefighters were riding on the sides and the tailsteps of the apparatus. This has always been a dangerous thing to do. And, in these “modern times”, the apparatus travels at greater speeds, which increases the dangers of riding on the outside fire apparatus. Therefore, in 1994 the company purchased a used 1985 Chevrolet four-wheel drive Suburban from the Wolfington Body Co. in Eagle, PA. This vehicle was used to transport personnel to and from emergencies. And, the department instituted a policy that no longer allows personnel to ride on the outside of any apparatus and they must be belted into a seat. Chester County Chief Fire Marshall (Car 7) William “Pop” Winters passed away will fighting a fire with his home company, Atglen Fire Co., on October 10, 1997. The Alerts were asked to participate as part of the Chester County Honor Guard during the viewing and funeral of Chief Winters. At the funeral service it was announced that County Car 7 was officially retired from service and will no longer be used. In addition to the focus of their mission, the company has worked diligently to continue to be in the forefront of the public in order to gain and maintain moral and financial support from the community. Participation in community events, fire prevention, and safety awareness demonstrations are a significant part of the effort of many dedicated members. Particular attention was given to building and maintaining a relationship in good standing with Borough Council throughout the 1990’s. The Alert Fire Co. has been very fortunate to be part of a community that supports its fire departments operations through local government funding from the Borough of Downingtown and East Caln Township,. However, the company must also rely on the support of the Downingtown Firemen’s Relief Association and special fundraising events to subsidize fire operations. To maintain the building that houses the fire company equipment, the members rely on a yearly fundraising drive, building rentals, and special fundraising activities such as the annual chicken barbeque that was started in the mid 1960’s. On occasion the company was blessed with philanthropic gifts in the past. Recently, there were two special times that this occurred. The first occurred after Mr. Swank passed away and bequeathed his entire estate to the company in 1985. This estate was invested and the Philip T. Swank Memorial Scholarship was established at the Downingtown Area High School, to be awarded to graduating seniors that are members of, or children of a member of the company. The second was a dedicated member who recently funded a significant portion of a building improvement project in the engine room. In 1997 it was time again to replace a valued piece of equipment that served the community for almost 30 years. The 1969 Mack Pumper was renewed by the delivery of a 1998 R. D. Murray pumper constructed on a Spartan chassis. It is powered by a 430 horsepower Detroit Diesel engine and features a spacious ten-man cab with seating for eight, 2000 GPM computerized Hale pump with foam capabilities and 2000 feet of five inch supply hose in addition to 2 ½” and 1 ¾” handlines, 700 gallons of water and large diameter hose appliances. The second truck that was replaced was the 1985 Chevrolet Suburban. It was replaced with a new diesel, 1999 Chevrolet four-wheel drive Suburban purchased from Robert’s Auto Mall of Downingtown for $44,056. The third piece of equipment that was replaced was the 1971 Chevrolet brush truck. It was replaced with a 2000 Ford Super Duty F350 four door pickup truck, purchased for $63,000. from Sloan Motors of Exton. The new brush truck features four wheel drive, a 360 GPM water and foam skid unit Darley pump, 170 gallons of water, 10 gallons of Class A foam, 3500 watt generator, lights and a slide-out equipment tray. The 1969 Mack pumper was sold to Hallan J. Usher, Life Member of Minquas and antique Oldsmobile enthusiast. Mr. Usher has entered and won first place prizes in many truck shows and pumping competitions. The 1985 Chevrolet Suburban was sold to the fire chief of the Churchtown Fire Co. of Lancaster County, PA, to be used as his personal response vehicle. And, the 1971 Chevrolet brush truck was sold to a private citizen in Downingtown who removed all of the fire equipment and restored it back into a classic white over yellow pickup truck. In 2000, the full company traveled to King of Prussia, PA for the 121st Annual Pennsylvania State Fireman’s Convention Parade and won the following awards: Second Place – Best Appearing and Equipped Pumper, 1990 – 2000 and the Grand Prize, First Place – Best Appearing Fire Department in Uniform with Music. The Grand Prize was made possible with the help of the 200 member Downingtown Area High School Blue and Gold Marching Band. In the line of march during the parade were an Honor Guard of Alert Officers, the Marching Band and the following apparatus: Squad 45, Brush 45, Retired 1969 Mack Engine 45, Engine 45, Rescue 45 and Tower 45. The impressive site covered a three block long distance. On June 02, 2001, at 4:00 PM, the company celebrated its sixth Grand Triple Celebration with the housing of the three newest vehicles. President G. Bruce Nixdorf welcomed all of the guests to the ceremony. Former President and department chief Thomas E. Lee, Jr. was the Master of Ceremonies for the evening housing. Borough Council President Michael M. Menna and East Caln Township Supervisor Edward Dymek made the official presentation of the three new trucks to fire department Chief Gregg S. Nelms. The new Suburban squad truck was housed by members of the Uwchlan Ambulance, Lionville and West Whiteland Fire Companies, followed by the housing of the new brush truck by the East Brandywine, West Bradford and Thorndale Fire Companies. Then the Minquas Fire Company housed the new pumper. Refreshments, a barbeque style buffet and dancing followed the dedication and were enjoyed by all of the guests. Donations by several businesses in East Caln Township in 2002 and 2003 made it possible for the department to purchase the first two Bullard Thermal Imaging Cameras. These are cameras that detect heat energy waves and translate them into viewable images on the camera. The energy waves are not blocked by smoke, allowing firefighters to use thermal imagers to see through smoke, enabling them to find victims faster, identify the seat of the fire earlier, and detect structural dangers that could put them at risk. Through the continued donations from the businesses in the township, the department now has a total of seven TI’s. Three of the TI’s are on each major truck at each station and the remaining one is in the department chief’s vehicle. The Downingtown Firemen’s Relief Association, in 2004 purchased the first two AED’s (Automated External Defibrillator) to be carried on the first due fire trucks of each station. An AED is a device that analyzes the heart’s rhythm during a cardiac arrest, for any abnormalities and, if necessary, directs a rescuer to deliver an electrical shock to the victim. This shock, called defibrillation, may help the heart to reestablish an effective rhythm of its own. Today, an AED is carried on all major equipment and the three chief officer vehicles of the department. During the late 1990’s Borough Council contracted with a private consultant to conduct an independent study of the fire and police departments. The study recommended that the major fire apparatus should be replaced with new equipment after 15 to 20 years of purchase, due to the increased call volume and maintenance costs of large vehicles. In 2004 President J. Patrick Butler assigned a new truck committee, consisting of Mr. Nelms (Chairman), Jerry L. Keen, Christopher Keen and Jeffrey W. Trego to investigate the replacement of the 1987 ladder tower and rescue trucks. Due to the Minquas also investigating the replacement of their 1976 Mack pumper and 1983 air/light truck, the committee and Borough Council decided to only replace the rescue truck at Alert, at this time. With the ladder tower scheduled to be replaced next. The committee chose, in 2005, to partner with Pierce Manufacturing of Appleton, WI to manufacture a 42 ft. long tandem axle rescue truck on a Pierce Lance chassis. The new rescue truck is scheduled to be delivered in mid 2006. Also, in 2004 the department was awarded a Pennsylvania Emergency Management Grant that enabled the company to purchase a 14 ft. long inflatable rescue boat and trailer in 2005. The grant also allowed the company to purchase additional personal flotation devices, cold water suits and additional swift water rescue equipment and training. The active force members continue to spend many long hours in training and fundraising for the company to provide the community a safe place to work and live. In November of 2005, Captain C. Keen, Lieutenant Trego, Firefighters Jeffrey S. Stevens and William Rees were the first members of the company to successfully complete certification with the National Board on Fire Service Professional Qualifications in the course of Firefighting I. The men and women of the Alert Fire Company No. 1 of Downingtown are proud and dedicated volunteers of many long hours to this very fine organization rich with heritage and family tradition. And, today for over 115 years, the motto of the company (“The Danger of our Citizens Prompts us to Action.”) continues to be the spirit that drives the group to volunteer. As noted in the opening statement from 1908 (“True to its name and motto, the Alert Fire Company No. 1 is ever ready to respond to the call for the protection of the life and property of the citizens of Downingtown and vicinity.”), the same quote can be written today about the members of the 100% volunteer organization.